Compote, the French for 'mixture', describes the beautifully simple method of slow-cooking fruit in a sugar syrup. It works well for rhubarb on its own or for a combination of rhubarb and soft fruit or spices. There are rarely strict recipes for something as informal as a compote and there is little margin for error. 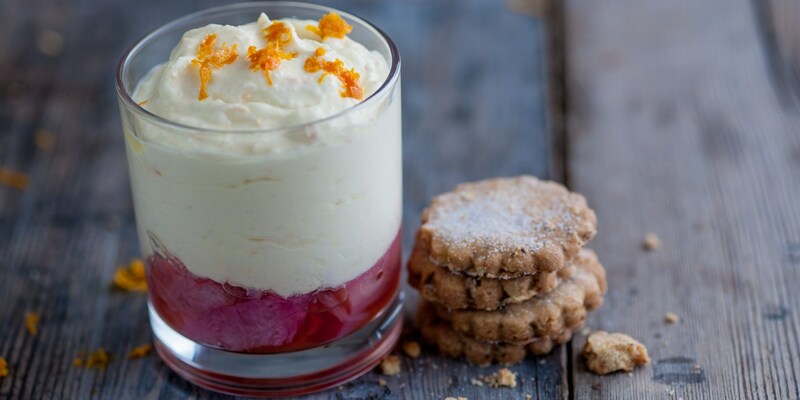 Treat a compote in the relaxed fashion in which it's made: serve it hot or cold, on top of yoghurt, with a slosh of custard or as a fruity topping for a sponge cake, loaf cake or scone. Extra flavours can easily be added or infused into the compote, such as fresh ginger and orange peel or spices like vanilla and star anise. Experiment by adding other fruits and berries to the saucepan such as strawberries. The water in the recipe can be swapped for other liquids like orange juice or lemon juice. Be aware that it will impact the sweetness so adjust the amount of sugar added as required. A sticky compote is a great breakfast ingredient when served with yoghurt and granola. It makes a quick and easy dessert with a scoop of ice cream or clotted cream and can even be heaped on to a puff pastry sheet and baked into a galette. Compote can even be a delicious way of introducing new flavours to a sponge-style dessert.